Award Winner of the1991 Penang Durian Competition. It originated from Sungai Pinang, Balik Pulau. This specie was first budded by the late Mr. Lau Kun Poh. The parent tree of this specie has long desiccated while the second generation trees are over 40 years old. 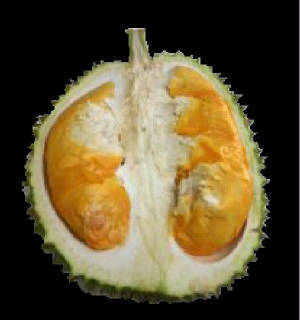 The flesh of the Kun Poh durian fruit are famous for their attractive reddish colour. It has a thick fragrance and is slightly bitter-sweet in taste. Price (eating at durian farm 2010) ranges from RM$8 to RM$18 per kg.